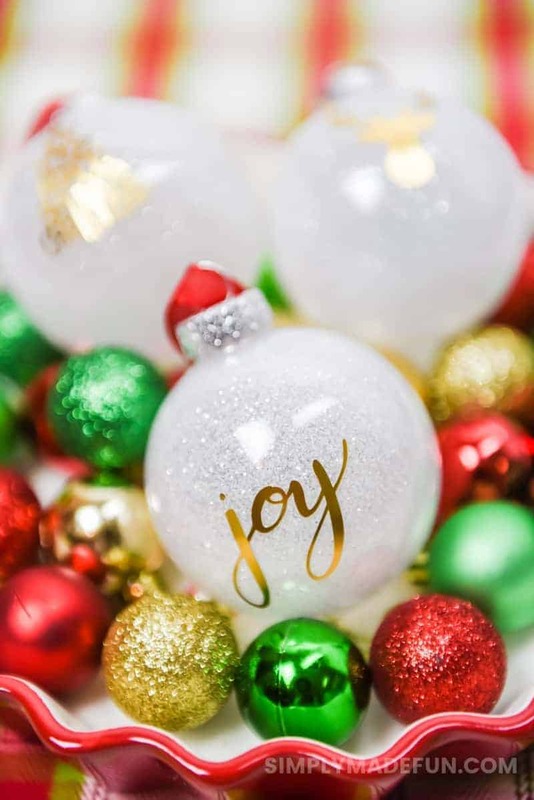 Get the kids in on the fun this year and make your own Glittered Ornaments for your Christmas tree! This year I’ve decided that I’m not putting up our tall tree. I tried last year with a newborn and it stood completely naked all season long because I had no time to put ornaments on it. So this year I took a bit of the pressure off of myself and decided that a four-foot tree would work perfectly for our needs and small apartment. Since I’m already going a bit off-book with a smaller tree I decided to also decorate it completely differently this year. Eventually it’ll be all Harry Potter themed (I cannot wait to share my plans with y’all! ), but for now I’m doing some fun traditional glittered ornaments to share! Y’all know how much I love vinyl and how I use it for everything when it comes to making crafts with my Silhouette Machine. But guess what, that gold lettering on the ornaments isn’t vinyl! I really wanted to try something different for this project so I used printable foil instead. I think I like vinyl more, but the foil worked well for my needs too! When it comes to Christmas I like having my tree and the decorations up for as long as I can. As a kid we used to put up our tree on Black Friday and I tried very hard to restrain myself and carry on that tradition when Chris and I got married. He’s not that into putting up the tree so I usually do it on my own which means I usually can’t do all the decorating in one day. So I tend to start the week before Thanksgiving and slowly decorate the house. This year I started a tad bit early, but I’ll just blame it on blog projects. Really though, I just love Christmas and couldn’t wait! (shhhh….don’t tell Chris). Now that we have a young child I don’t want to put up my very breakable (and really pretty) ornaments on the tree. At least, not until he’s old enough to understand why he can’t touch and pull on them (it’s a battle right now. One I have no energy for!). Which is why these glittered ornaments are perfect! They are plastic, so my little one can’t get a hold of them and hurt himself. And really, that’s probably my favorite thing about them! I’m definitely ready to get in the Christmas spirit now and want to spend the next few weeks making glittered ornaments in every color! They’re so fun and easy, what more could you want out of a craft? a project you can do with your kids! 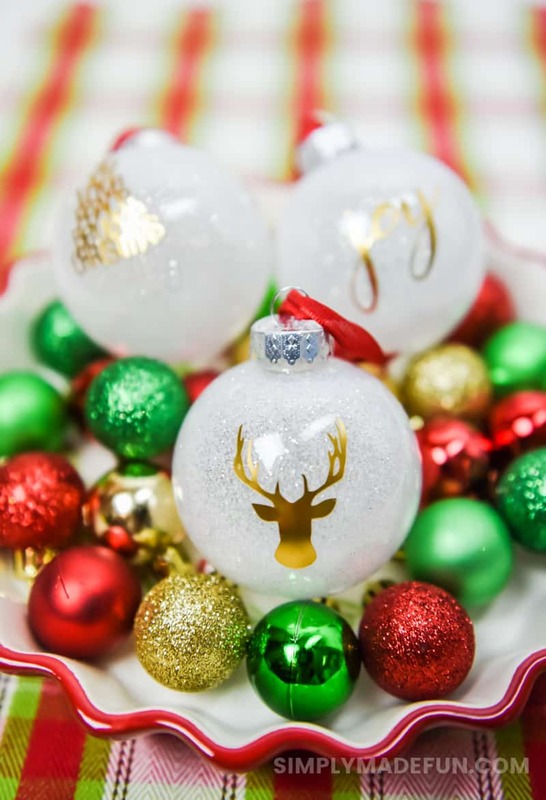 Want to make your own Glittered Ornaments? Pour your Polycrylic into your small squirt bottle. Then pour a small amount into your ornament. Turn the ornament around in a slow circle until the entire inside is coated with the polycrylic. Then set it upside down in an egg carton (or on a plate) to let the excess drip out (I waited about five minutes). Use a funnel and pour glitter into your ornament Rotate the ornament slowly, making sure you cover every inch of the inside of your ornament. Fine glitter looks better for this type of project, but you can use larger if you like! Place the ornaments back in the egg carton until they are dry (I waited about 5 to 10 minutes). Now put the foil on your ornaments! After coating the inside of your ornament with glitter, pour it back into it's original container. You can use it for later! Don't try to weed the foil, it was terrible! You can actually just pull the designs up off the backing with your fingers and that will leave the insides of the letters/designs behind. 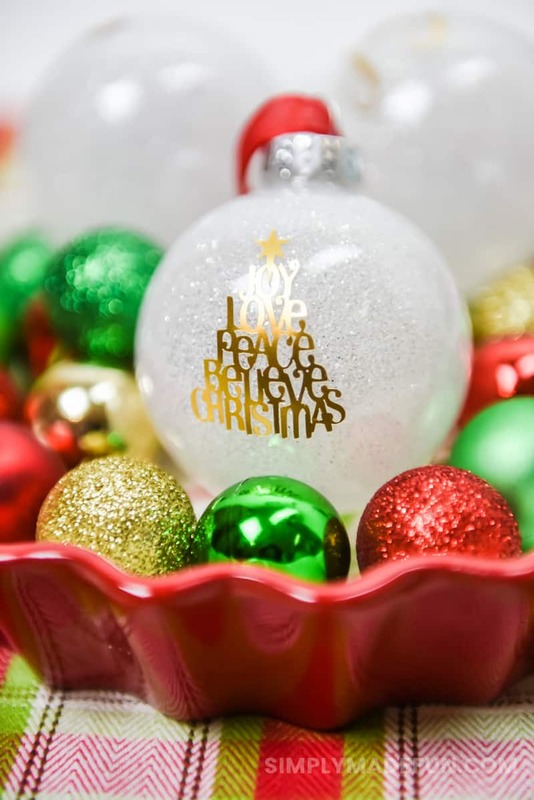 do you love Christmas crafts too? you need to check these out! These are SO cute!! I definitely need to try to make these, what a perfect gift. Thank you Macy! They would make really great gifts, there are so many possibilities with them! Gorgeous! These would be great teacher gifts! Those are so pretty! Makes me excited for Christmas! These are super pretty! I love glittery ornaments on our trees.